NOTE: THIS IS THE ACTUAL RECORDING OF THE OPENING OF GLOBAL LEARN DAY, MAIDEN VOYAGE, OCTOBER 7, 1997. Welcome to Global Learn Day, an expedition, exhibition, and experiment and a world wide conference. As an expedition, Learn Day will take its participants from Seoul to Santiago, from Cape Town to Cairo, Wellington to St. Petersburg, Bangladesh to Belgium; Hartford to Honolulu. As an exhibition Learn Day will showcase thousands of college courses available through internet delivery from hundreds of Universities worldwide. As an experiment it will offer a convincing demonstration that the Internet is a powerful electronic truck which can take the priceless cargo of a college education to every corner of the planet. “Hi, I’m finding this whole idea awesome! “I am a Mohawk Indian from the National Iroquois Reserve in Southern Ontario, Canada. I’ve been teaching for approximately 20 years and now returned to school to complete a doctorate in Education. I have been a computer user for more than 10 years and have taken the greater part of my Masters Degree via Telnet, Data-Pack and the Internet. We begin our journey at the far edge of the Western Pacific at the tiny island of Guam. Why Guam? Many have asked, the answer is easy. Guam is where the planet begins the new day. It is also where island residents are proud to boast, “Here on Guam the sun first shines on American Soil”. What is the purpose of this journey? What is the purpose of this conference? Although the undertaking itself is complex, our purpose is simple. We seek to expand new horizons, make new discoveries, seek new opportunities. ‘We do not read even of the discovery of this continent without feeling something of a personal interest in the event. Without being reminded how much is has affected our own fortunes and our own existence. It would still be more unnatural for us – and therefore then for others – to contemplate with unaffected minds that interesting, I may say that most touching empathetic scene. The great discoverer of America standing on the deck of his shattered bark, the shades of night falling on the sea, no man sleeping, tossed on the billows of an unknown ocean, yet the stronger billows of alternate hope and despair tossing his own troubled thoughts. Extending forward his bare frame, straining westward his anxious and eager eyes — till heaven at last granted him a moment of rapture and ecstasy in blessing his vision with the site of the unknown world. These words spoken on June 17th, 1825 remind us very well of our own troubled thoughts as we set out to raise hopes as a way of an exciting westward journey around the globe today. Thank your for joining us! However well — or however badly — this expedition goes — and we must expect difficulties — both human and technical today — we will have at least made a serious attempt to expand the horizons of knowledge acquisition and knowledge distribution. 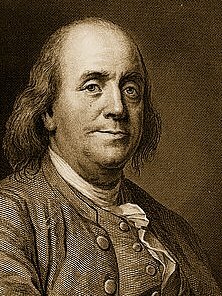 Which is the goal of the Institute and the reason that on our doors is the name Benjamin Franklin.